1.6.1. The Rocket Core - a Library of Processor Components! 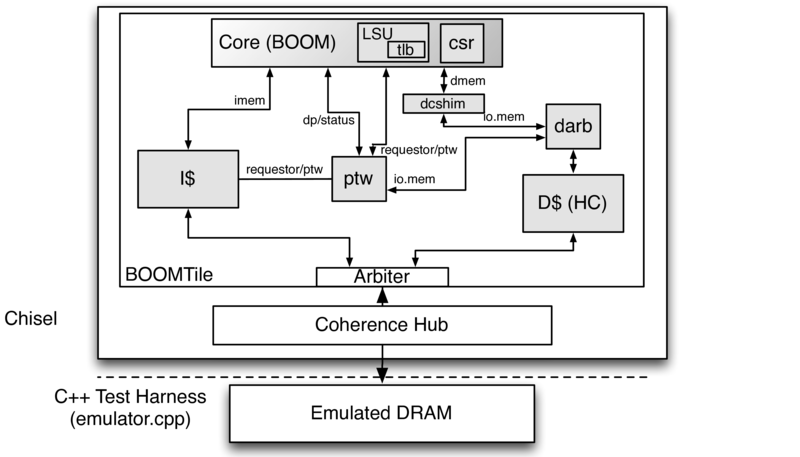 As BOOM is just a core, an entire SoC infrastructure must be provided. BOOM was developed to use the open-source Rocket-Chip SoC generator https://github.com/freechipsproject/rocket-chip. The Rocket-Chip generator can instantiate a wide range of SoC designs, including cache-coherent multi-tile designs, cores with and without accelerators, and chips with or without a last-level shared cache. To manage the wide array of actively developed projects that encompass Rocket-Chip, the Rocket-Chip repository makes heavy use of git submodules. Selected directories of the Rocket-Chip repository are shown below. bootrom/ Files used to create a boomrom. chisel3/ Git submodule pointing to the source code to the Chisel3 language itself. emulator/ The Verilator simulation tools and support directories. firrtl/ Git submodule pointing to the source code to the FIRRTL project. hardfloat/ Git submodule pointing to the Berkeley Hardware FPUs. regression/ Used for TravisCI regression testing. riscv-tools/ Git submodule that points to the RISC-V toolchain. src/ Source code for rocket-chip. torture/ Git submodule that points to the RISC-V Torture Test Generator. vsim/ The VCS ASIC Verilog simulation and build directories. Rocket is a 5-stage in-order core that implements the RV64G ISA and page-based virtual memory. The original design purpose of the Rocket core was to enable architectural research into vector co-processors by serving as the scalar Control Processor. Some of that work can be found at http://hwacha.org. Rocket has been taped out at least thirteen times in three different commercial processes, and has been successfully demonstrated to reach over 1.65 GHz in IBM 45nm SOI. As its namesake suggests, Rocket is the baseline core for the Rocket-Chip SoC generator. As discussed earlier, BOOM is instantiated by replacing a Rocket tile with a BOOM tile. However, from BOOM’s point of view, Rocket can also be thought of as a “Library of Processor Components.” There are a number of modules created for Rocket that are also used by BOOM - the functional units, the caches, the translation look-aside buffers, the page table walker, and more. Thus, throughout this document you will find references to these Rocket components and descriptions on how they fit into BOOM. The source code to Rocket can be found at https://github.com/freechipsproject/rocket-chip.